At the time of the Civil War Duane Street was part of New York’s bustling textile district. Loft buildings here housed importers and converters of textiles. Dry goods merchants and dress makers shopped the neighborhood for select wares. On the first floor of No. 146 Duane Street was Fairchild & Fanshawe, importers of silks and dry goods. Above, on the second floor, was Auffmordt, Hessenberg Co., importers and dealers in “cloths, cassemeres, etc.” The five-story, white marble-clad building was filled with textiles which, tragically, proved to be highly combustible. Around 10:00 p.m. on January 16, 1864 fire broke out on the second floor. The blaze spread with what The New York Times called “fearful rapidity, extending from floor to floor with increasing fury, defying all the efforts of the firemen until the entire building had been destroyed.” Two firemen lost their lives fighting the blaze. At the time of the Duane Street blaze, cast iron facades were quickly gaining popularity. The large sections could be quickly assembled, and repeated decorative elements were relatively inexpensive and easily cast. But most attractive to owners of buildings like No. 146 Duane Street was the fire-proof quality of cast iron. J. B. & W. W. Cornell & Co. operated its ironworks foundry from Nos. 135-143 Centre Street. From here were produced the castings that would form the façade of the new No. 146 Duane Street. The five-story Italianate structure was beautifully proportioned. Wide openings at street level provided for an impressive storefront while the upper floors tried hard to look like stone. Mock quoins rose up the sides and classical pediments capped the second story windows. Decorative elements as well as floor heights lessened with each succeeding story. By the 1880s Duane Street between West Broadway and Church Street was filled with shoe manufacturers and merchants. In 1888 the Annual Report of the factory inspectors of the State of New York listed F. & A. S. Kaliske, shoemakers, as doing business here. But the following year would see the arrival of an incredibly long-term tenant. Firefighters did not arrive for an hour and a half; by which time the upper two floors were engulfed in flames. Not until 4:00 am. was the fire finally extinguished. The blaze, which firemen supposed “was due to spontaneous combustion,” gutted the top floor, “while the stock on the lower floors was badly damaged by water,” said The Times. The cast iron façade, living up to its reputation, was uninjured by the conflagration. No. 146 Duane Street was repaired and business went on. At some point Nathaniel Fisher & Co. installed a beautifully ornamented clock on the wall above the storefront. Such clocks were popular methods of Victorian street advertising. As the 20th century progressed, Fisher & Co. continued to manufacture and sell shoes from No. 146 Duane Street. In the meantime, other small tenants came and went. In 1914, Horseless Age: The Automobile Trade Magazine noted that space had been leased in the building to Thirty-Five Per Cent Automobile Supplies Company. Irving Fisher continued to head the company. He purchased a home at No. 67 West 50th Street in the fashionable block just off Fifth Avenue. Here he lived with his wife and five children, tended to by three servants. Nathaniel never married. He lived with his surgeon brother for a while before purchasing his own enviable residence at 46 East 52nd Street. 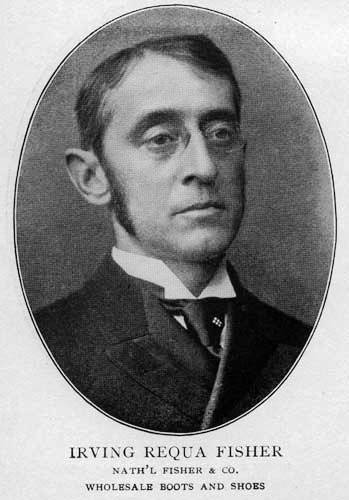 He died at home on November 8, 1923 at 63 years of age. Two years later the 73-year old Irving, now living at 116 East 63rd Street, died on January 5, 1925. Despite the brothers’ deaths, Fisher & Co. continued to manufacture and sell shoes from No. 146 Duane Street for nearly three more decades, until 1953. 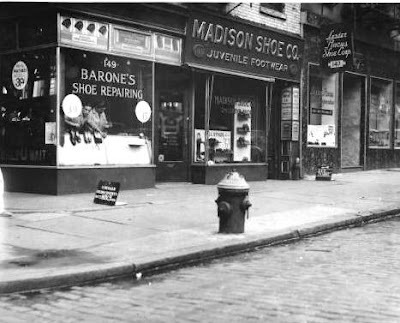 When it closed for good, its shop windows had displayed high-button shoes in the 1890s, jazzy patent leather pumps in the 1920s, and black-and-white saddle shoes in the 1950s. For another half century the building would be home to various manufacturers and other companies; the handsome yet neglected building growing dingy and rusted. Yet the magnificent clock bearing the name Nath’l. Fisher & Co. still held its place over the storefront. As the century ground to a close the Tribeca neighborhood experienced a renaissance. Celebrity-owned restaurants cropped up in former warehouse loading docks and factory lofts morphed into apartments. Today the street level space is home to the Jewish Community Project. The dignified façade remains unchanged and the wonderful Fisher & Co. clock still holds its place of honor.